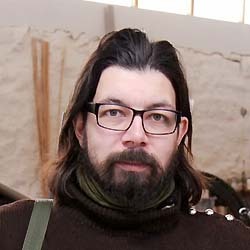 Hello I’m Svend-Allan and I want to talk about linocuts, woodcuts, litographs, etchings, birds, words and guns. In other words I would like to talk about Svend-Allan and his work. Svend-Allan Sørensen (DK, 1975), graduated from Funen Art Academy in 2002. In 2014 Svend-Allan Sørensen received The Queen Sonja Nordic Art Award. This award also included a stay at Atelje Larsen in Helsingborg (S), as well as exhibitions in Oslo, Stockholm and through April at Scandinavia House in New York. SAS has shown solo exhibitions at Museum Jorn (DK), Nikolaj Kunsthal (DK), Vendsyssel Museum of Art (DK) and Overgaden -Institute of Contemporary Art (DK) and participated in exhibitions at Vestsjælland Art Museum (DK), Funen Art Museum (DK), Esbjerg Art Museum (DK), Den Frie (DK), Silkeborg Bad (DK), Johannes Larsen Museum (DK), Växjö Konsthall (S) and Waldemarsudde (S). Svend-Allan Sørensen is represented in private and public collections, including Statens Museum for Kunst (DK), H. M. Queen Sonja Art Collection (NO), Museum Jorn (DK), New Carlsberg Foundation (DK), Vendsyssel Art Museum (DK), Vejle Art Museum (DK), National Art Fund (DK) and Nykredit (DK).